Even though I run a marketing agency, I think it’s always best to hire an in-house SEO professional, especially if you’re producing a lot of content. 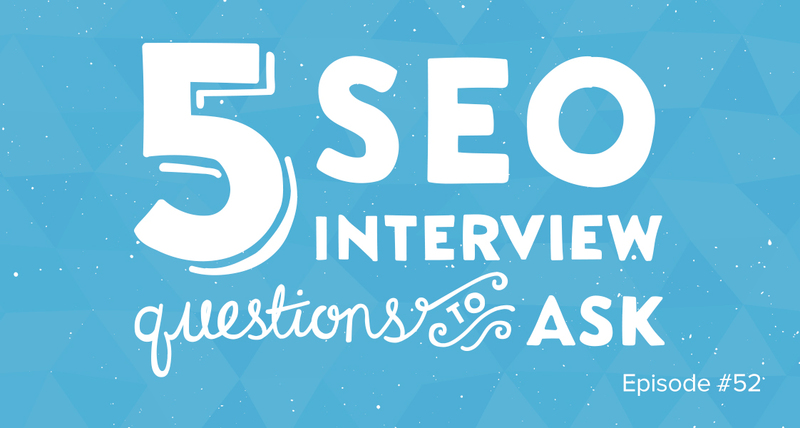 Today I’m going over five SEO interview questions to help you make a successful hire. Link building has changed a lot in the last few years, so you can see if they talk about buying web 2.0 links and spamming, or if they go the white-hat route of creating great content. You can see if they’re practical or regurgitating what they’ve read online. A lot of people mention MOZ, Screaming Frog, SEO Spider, which shows they know how to use them for the technical purposes of auditing a website. You don’t want a cookie cutter answer like Google Analytics, because it’s not a core tool that will let you dive into key SEO metrics. Here you can find out what type of metrics they consider successful. You can also see if you consider this kind of work impressive and if it’s what you’re looking for. You can ask why they think it was their biggest win and their steps behind improving that campaign to get more insight. A lot of candidates will say they don’t have time to read, but with so many people sharing valuable information and so many updates, you want to hire a person who reads. When people say they read blogs like Fast Company or Business Insider for SEO insight, that’s an automatic disqualification. A good SEO knows how to promote a great piece of content. A really good content promotion process takes a lot of time to execute – sometimes it takes longer than producing the content. You want to uncover their step-by-step process, and you can give them a homework assignment to see how they execute on it. In 2015, content promotion is a huge part of link building. Growth Everywhere Hiring Product – releasing soon, stay tuned!